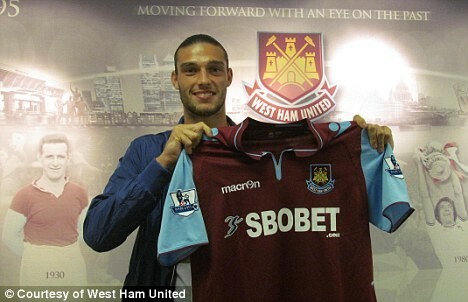 Liverpool and England striker Andy Carroll has joined West Ham on a season-long loan, the Merseyside club have confirmed. Carroll's position at Anfield has been the subject of considerable speculation since new manager Brendan Rodgers took charge earlier in the summer. The 23-year-old had also been linked with a return to former club Newcastle but the Hammers have now acquired his services for the 2012/13 season. A brief statement from Liverpool read: "Liverpool Football Club can confirm that Andy Carroll has joined West Ham United on a season-long loan. The striker will spend the whole of 2012/13 with Sam Allardyce's team." Carroll joined the Reds in a club record £35million deadline day deal in January 2011 but has failed to establish himself on Merseyside. Reports that he was poised to move to Upton Park grew during Thursday evening and he was conspicuous by his absence as Liverpool faced Hearts in a Europa League qualifier. Carroll told West Ham's official website: "It's great to be here at West Ham and all signed up - I just can't wait to get started now. I want to be playing games and obviously hoping to score some goals. I know the manager well and some of the lads, so it is nice for me to come to a place where I know people. "I'm hoping to add a lot of goals and create a few chances. I know Sam from Newcastle and he was a massive reason for me coming. When I worked with him at Newcastle it was great so it was a no-brainer really."